When You buy a cot evaluate it carefully ensure that your baby's resting place is safe, as from the nursery products, cribs are in the first place for infant death. The cot is shown in the picture is suitable for all babies, even when newborn. 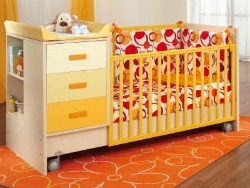 The space and safety of cot of this type is essential after the age about 6 months. Another advantage is that the slatted sides allow the baby to see out. The distance between slats must be no more than 2-3/8inches (6 centimeters) to protect infants from falling out and toddlers from trapping their heads between the slats. The side rails that lower should have at least two locking devices to prevent older babies from releasing them. When a side rail is lowered, its top should be at least 9 inches(23 centimetres) above the mattress support. To protect older babies, the top of the raised side rail must be at least 26inches (66 centimetres) above the mattress support at its lowest position. If the crib has corner posts, they must be either flush with the top of the headboard and footboard or very tall — over 16inches (41 centimetres). Anything in between is a potentialstrangulation hazard. Evaluate a used cot with extra care. There may be too much space between slats, or elaborate cut-outs in the headboard and footboard that can trap a baby's head. Get the firmest mattress you can find. Don't rely on manufacturers' labels — test it yourself. This is extremely important because soft mattresses may play a role in sudden infant death syndrome (SIDS). To prevent suffocation, never place soft bedding or soft toys (blankets, fluffy comforters, pillows, plush toys) in your baby's cot. Although bumper pads are widely used, their safety has been questioned. One study, using data from the U.S. Consumer Product Safety Commission (CPSC), found a number of accidental deaths appeared to be related to the use of bumper pads in cribs and bassinets. Many paediatric organisations discourage the use of bumper pads in cribs to avoid accidental suffocation. Never place a crib near a window or drapes, because your baby can become entangled in window blind and drape cords.Remove bibs and necklaces when your baby is in the crib. Do not hang toys by strings.